Dazhao Temple, 'Wuliang Si (Infinite Temple)' in Chinese, is the oldest building and the largest temple in Hohhot, Inner Mongolia. Locally, people usually refer to it as the Silver Buddha Temple (Yinfo Si) for it is here that there is a rare silver statue of Sakyamuni that measures 2.5-meter-high (8.2-foot-high). The construction of Dazhao Temple was completed in 1580 during the Ming Dynasty (1368-1644) and it is therefore the oldest Lamaist Buddhist temple in Inner Mongolia. There was a major reconstruction in 1640 although much of the original architectural style was retained. 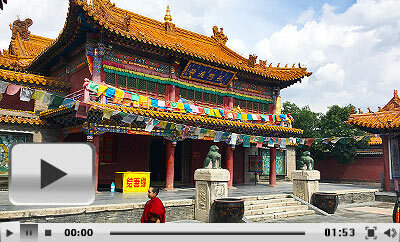 Dazhao Temple owns its fame to a visit by the third Tibetan Dalai Lama in 1586, when he came to dedicate the Silver Buddha statue. As a consequence Hohhot became a religious center for people from all over Mongolia who came to worship. Another notable event in the temple's long history was a visit by Emperor Kangxi during the early part of the Qing Dynasty (1644-1911). The Dazhao Temple is now a well-known tourist attraction because of the impressive buildings, splendid statues, delicate frescos, musical instruments and fine collection of Buddhist scriptures. Of its abundant religious relics perhaps the most notable are the 'Three Marvelous Treasures', a title given to the Silver Buddha, the carved dragons on the huge golden pillars on either side of the statue and the murals commemorating the Emperor's visit. Except for the main hall, the existing buildings within the Dazhao Temple complex are nearly all in the Han style. The main hall is a lamasery combining both Tibetan and Han styles of architecture. It has three parts. The front part is a two-story hall with an empty pavilion in the first floor; Jing Tang (the hall for chanting) and Fo Tang (the hall for worshiping Buddha) are central and rear sections. The perfectly preserved Silver Buddha lies in Fo Tang as it has for some four hundred years. In the splendid and solemn front of the hall, there is a pair of iron lions with their heads held high. Take bus no. 6, 38, 42, 58, 59, 209 or K3 and get off at Dazhao Station.